Reports are currently coming in of an incident today, where 28 people were trapped on Corkscrew mid-course. 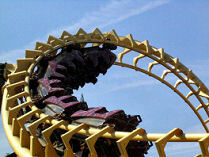 After failing to complete the coaster circuit, the riders were trapped on the ride for 90 minutes while being rescued. We are currently not certain where the train failed, but a spokesman for the park has said that an investigation is under way, and no persons were hurt. The train came to a halt on the track, about 10 - 12 feet above the ground, and ladders were used to lower the passengers to the ground. All passengers were offered tickets that allowed them to avoid queuing for the other rides, or vouchers for a free entry on another day. This is now the second incident to involve Corkscrew, as in 1997, four staff members were trapped on the ride during a routine test run. Not good news for Corkscrew, bearing in mind this year is its 21st birthday, and we were supposed to be celebrating.